Volkswagen successfully transitioned from a car for '70s hippies to an entry-level status car for '90s yuppies. 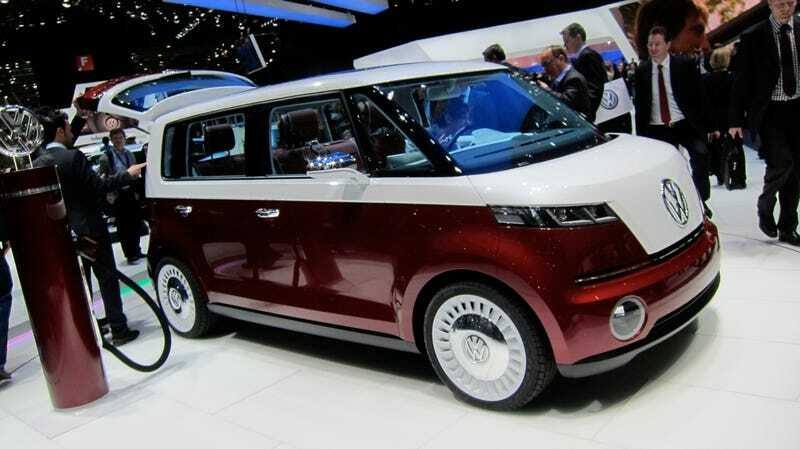 With the re-imagined VW Bulli Concept the company's making a stab at both markets. Hipyups? Yuphips? Designed as yet another evolution of the Microbus/Type 2 concept — including the retro two-tone paint — it's hard to determine exactly where on the yuppie-hippie continuum this vehicle falls. In defense of the the hippie position, the vehicle offers a unique 3+3 seating, which means all your butts will be pressed together in a way narrow-waisted prep school waifs would find unappealing. There's also power from a 40 kWh electric-motor, good for a theoretical range of 186 miles. Free love and no emissions, man. Jerry Rubin would dig it. On the other, expensively moisturized hand is a yuppie car with a removable iPad in the center console. The seats also fold in such a way as to make the small van an ideal workspace. Yuppies love to work. The deciding factor will come sometime in the future if the van actually goes on sale. Under $25K it's something six hippies could probably band together and afford. Over $25K it's solidly in single yuppie territory. And over $50K it's purely for the Urban Haute Bourgeoise.